MIDDLEBURY, Vt. – Middlebury College has completed the installation of snowmaking equipment on five kilometers of trails at the Rikert Nordic Center, a 50-kilometer cross-country skiing area in Ripton, Vt., owned and operated by the college. The new, $850,000 snowmaking system will extend the cross-country skiing season and all-but-ensure that there will be snow when the college hosts the NCAA skiing championships in March. While snowmaking is commonplace at many of New England’s alpine skiing areas, it is less of an everyday occurrence at Nordic centers. Snowguns in operation at Rikert Nordic Center. “Rikert now has the most extensive snowmaking system of its type among all of the Nordic centers in North America,” said Mike Hussey, director of the Rikert Nordic Center. Other cross-country ski areas have the equipment and the know-how to make their own snow, but Rikert’s five kilometers of coverage – the equivalent of about 3.1 miles – is the most extensive coverage in the Northeast, Hussey said. Rikert Nordic Center now has 20 “snowguns” manufactured by HKD Snowmakers of Natick, Mass., to make its snow. 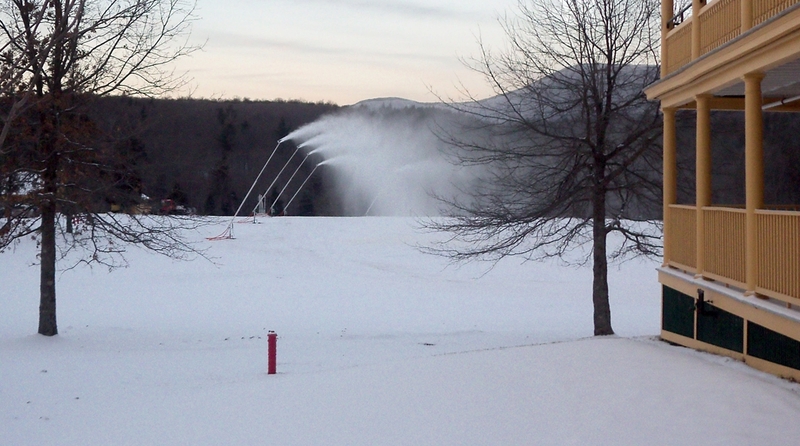 At full capacity Rikert’s snowmaking system uses up to 250 gallons of water per minute. For comparison purposes, Hussey estimated that a major alpine ski area such as Killington pumps about 10,000 gallons of water per minute. At 250 gallons per minute, the staff at Rikert can produce enough snow to cover five kilometers of trail in about 200 hours’ time. The system designed by Sno.Matic Controls and Engineering of Lyme, N.H., pumps compressed air and pressurized water through above-ground lines to each of Rikert’s moveable snowguns. As long as the temperature is below 32 degrees F. and the humidity is low enough, compressed air mixed with water droplets at the head of a modern snowgun will produce ice crystals, or man-made snow. And once a portion of trail has been covered sufficiently, the apparatus is moved to another section of trail while the staff grooms the newly made snow. The acquisition of a snowmaking system at Rikert was made possible by the generosity of Middlebury alumnus John Tormondsen and his family. A former first-team All-American Nordic skier and member of the Class of 1982, Tormondsen serves on the college’s board of trustees. Prior to the winter of 2011-2012, the college completed construction of a five-kilometer trail that was certified by the Fédération Internationale de Ski (FIS) as a “homologated” race course. In order to be certified, the trail had to meet FIS standards for width, climb levels and total elevation. Rikert’s new snowmaking capacity covers the FIS-certified course, which has been newly named the Tormondsen Family Race Trail. Hussey, Rikert’s director, said snowmaking should increase the Nordic center’s number of skier days and serve as a “tremendous benefit” to the Addison County region. “The real value of this system is to be able to make snow in the early portion of the season, to give skiers an early start and get them excited about cross-country skiing,” Hussey said. As of early February, the college has raised $600,000 toward the $850,000 cost of snowmaking at Rikert. Fund raisers are working to raise the remaining $250,000 before the end of the 2012-2013 ski season. More information about Rikert Nordic Center is available on the center's website.